This is the Valentine I made for my dear son Greg. "Roo" became my pet name for him in 2005 when we saw Pooh's Heffalump Movie. He was 6 years old then... He is a wonderful, taller-than-me teenager now. The pet name still slips out every now and then. When he opened his card this morning, his smile told me that he doesn't mind... Thank you Kim, for A Little Lovin, and to Heather Pulvirenti for the inspiration I took from her card in THIS post to create mine. 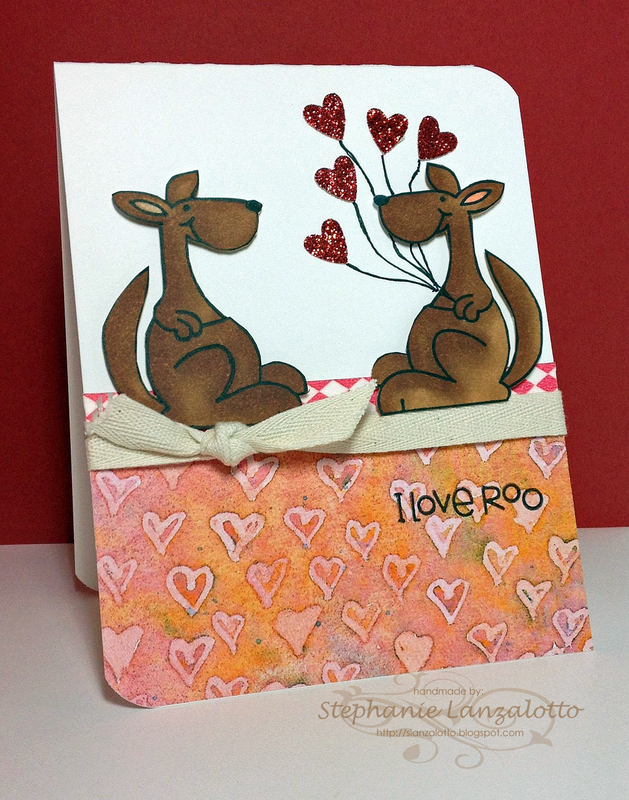 As part of the Paper Smooches Anniversary Celebration, Kim Hughes posted a special challenge with a prize : Create a NEW project that is FUN & CUTE! The winner will receive 3 NEW acrylic blocks and a stamp set and die of their choice! You have until Sunday, February 16th to participate. Winner will be announced on Monday, February 17. Thanks for stopping in and Happy Valentines Day! This is definitely fun and cute! Adorable really. Love that your now teenage son said "he didn't mind." I'd say for a teenage boy that was quite the compliment. Oh, this is so adorable. The fact that it is so personalized for your son makes it even more of a keepsake. I think I need to buy that kangaroo now. He/She is just too adorable. Did you see your FB shout out for this card? Congrats!